Huge showy blooms with rose-pink, apricot-pink and flashes of green. 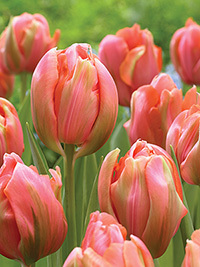 A beautiful double sport of the well known tulip 'Menton'. Mid to late spring, 40cm tall.